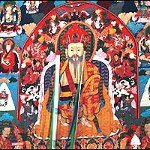 Death anniversary of Zhabdrung (Zhabdrung Kurchoe) is a public holiday and national day of mourning in Bhutan. It is observed on the 4th day of the 10th month of the Bhutanese calendar. This date falls in April or May in the Gregorian calendar. Zhabdrung was a title of great lamas in Tibet. It Bhutan, it almost always refers to the unifier of Bhutan as a nation-state, Ngawang Namgyal. The founder of the Bhutanese state is typically referred to as Zhabdrung Rinpoche. Ngawang Namgyal was born in Tibet in 1594. In 1616, he had to leave for Bhutan. In 1620, he established Cheri Monastery in Thimphu valley. Several years later, he founded Simtokha Dzong that helped him consolidate control over western Bhutan. In 1634, the Battle of Five Lamas occurred between Ngawang Namgyal and the combined Bhutanese and Tibetan forces. Zhabdrung Rinpoche won the battle and united Bhutan into a single state, establishing the dual system of government. Zhabdrung Ngawang Namgyal passed away in 1651. However, local governors conspired to keep his death secret for 54 years in order to prevent a dynastic struggle. They announced that Zhabdrung was on a silent retreat and issued orders in his name. Zhabdrung was buried in the Punakha Dzong.